I love bread. I would give up all other vices for bread. I believe I could live on bread, cheese & wine. I doubt I would be successful on a gluten-free diet (and honestly, I pray I don't have to try!) I especially love sourdough bread, but for a long time I was afraid of it. Not sure why, I do just fine with making regular bread. But I really only LOVED the sourdough you can get on the West Coast. Store-bought sourdough just isn't the same. 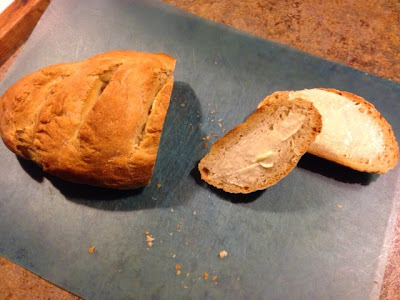 Then, Pinterest happened, and I stumbled upon a post for this bread that doesn't require yeast in the starter or when actually making the bread. Who would have though that was the key?? Don't be fooled into thinking you can do this quick. This bread takes TIME. Like all weekend time. You want to be sure your starter is frothy and thick. You want your dough to have LOTS of time to rise, rise and rise some more. I usually start Friday evening and bake Sunday morning. If you dare to take it on, read the recipe, 3-4 times, then read it again. Follow the recipe (except the part about waiting to add salt -- I've been addin the salt with the rest and it's been fine each time). TAKE YOUR TIME. DO NOT RUSH. But oh man, it is SO worth it because this is the BEST. It reminds me of my past life, when I was single, working for the airlines and when I would spend extra time in San Francisco on the Wharf and go to Boudin Bakery for clam chowder in a bread bowl. I plan to spend time this summer making bread bowls, freezing them, and bringing them out in the fall for chili (as I'm probably the only one in my family who would eat clam chowder). Happy Happy Birthday Jessica Fae!